The truth is in here. Sort of. 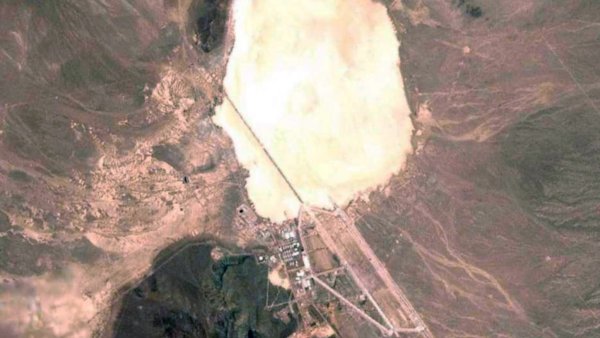 If ever you begin to question just how far the human imagination is willing to go, think of Area 51. Nothing more than a few square miles of flat desert in an otherwise unremarkable part of Southern Nevada, it has become one of the most mysterious and iconic parts of the planet for no other reason than the US Military have a fence around it. 2013 saw a long-awaited acknowledgement from the White House that the facility existed, but absolutely nothing in the way of specifics over what was going on there. Nature abhors a vacuum though, and the total lack of any official explanation from the American government means that the facility is *definitely* the home of alien beings, amazing futuristic tech, and experiments in the paranormal. Strictly speaking, there's not any... y'know... proof of any of this, but since when has that stopped anyone. Ever since the site was established in 1955 (actually, even its origins are hotly contested) the site has been the subject of conjecture, rumour, suspicion and conspiracy. Be they from intrepid UFO-watchers, truth-seeking vigilantes, or disgruntled former employees, the most extraordinary stories have emerged from the base's walls, but none more fantastical as what follows. The truth - or otherwise - is in here.